Chad Braidwood is the owner of Saratoga Olive Oil Co. and we’ve never encountered someone quite as zealous and passionate about their business. As Chad states simply, “It’s very, very easy to sell a good product. For me, this is a no brainer – I love doing it.” We were able to pop in and ask Chad about how he’s embraced the community and the science behind creating such a quality product. Vermont.com // I remember when we spoke before, you mentioned that you had previously been involved in the medical profession – how does one go about transitioning to olive oil? Saratoga Olive Oil Co // The transition to selling extra virgin olive oil (EVOO) was not as much of a career change as one might think. My brother, sister-in-law and myself were all in clinical research. There are extraordinary health benefits with consuming EVOOs and balsamic vinegars. I was with Johnson and Johnson at the time and we bumped into a clinical trial that was in Berkeley that was for cancer patients. One of the biggest aspects to cancer research is quality of life. In this clinical trial there was a sidearm where you took three tablespoons of EVOO and over time you were asked questions. How do you feel today? How is your outlook on your disease? The patients who were taking the EVOO were far more upbeat and optimistic. This really resonated with the three of us and we started doing more research going back to the Roman times and Mediterranean lifestyles. We encountered the taste before you buy concept and just ran with it. VTC // It’s easy to see some of the places where your scientific side comes out, even in the labeling of the oils themselves. SOOC // All of the oils that are sold at Saratoga Olive Oil Co. are laboratory tested for polyphynol counts, oleic acid counts and free fatty acid counts to ensure the consumer is receiving the healthiest and freshest EVOOs anywhere in the world! VTC // And how are your oils actually made – what is the process? SOOC // All of our oils are first cold press – we say press, but now everything is actually done by centrifuge, no more pressing typically. But it’s still all cold and that’s what’s really important. Whenever you add heat to the olive oil, you might get a higher yield, but you’re releasing far more free radicals, which are broken down carbon chains. You want the whole carbon chain of the polyphynol – and keep the free radicals (which cause oxidation of the skin or aging) from being released. From there our infused flavors are created with the essence of the flavor itself. For example, in Tuscan Herb, blend of oregano, basil, garlic, rosemary – we take fresh garlic and fresh basil and squeeze, releasing the oils and fragrances that epitomize the flavor. Always fresh, never dried out or susceptible to any fertilizers or GMOs – when we say it’s an organic product, it’s organic. VTC // As I look through the store, I can see oils and balsamics from around the world. How do you decide which types to carry and from where? SOOC // Great question – this my favorite part of the job! 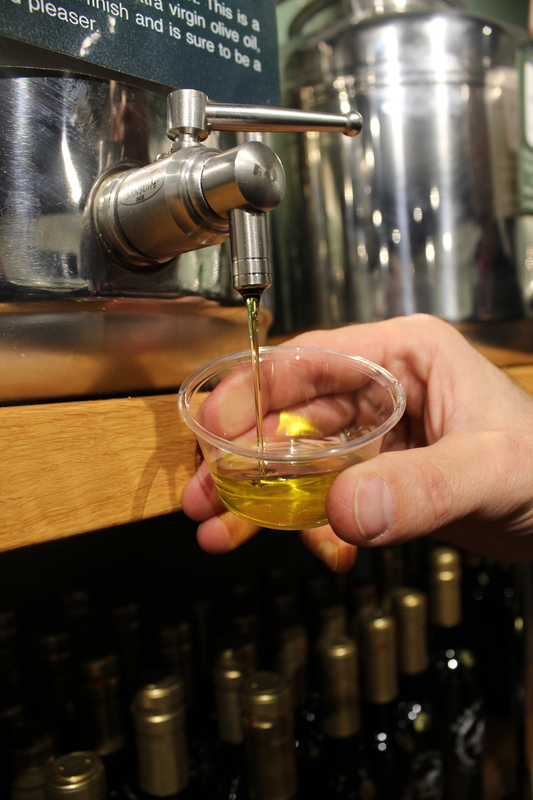 After the clinical trial in Berkeley, when we were doing our research on Roman times and the Mediterranean lifestyle, we noticed the connection between olive oils and wines. 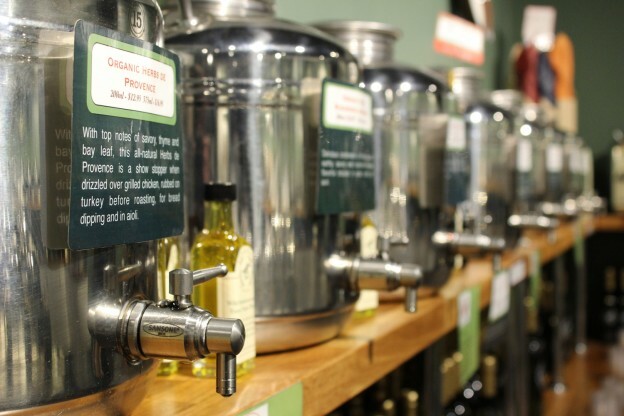 Where people are making good red wines, you get great oils! The temperatures and minerals in the soils provide different flavor contrasts. So, here you have two different presses of the same type of olive, Chilean Koroneiki and Greek Koroneiki – you try each of these and they’ll be very different. You might get the grassy overtone in each, but because of where each olive came from, you get completely different flavors. We follow the weather, was it sunny that season? Warm? Rainy? You can learn a lot about how it was affected by where it was grown and most importantly, if you follow it, you can predict where it will be best next. You’ve got to follow the crush. I had a 2010 crush Italian Nocellara de Belice – absolutely amazing, loved it! The 2012 came out and ‘eh, it’s alright’. It’s exactly like wines, different years, different weather, huge differences in flavors – follow the crush! VTC // I know that being a part of the community is huge for you – even in the products that you feature in the shop, lots of local favorites. SOOC // Yeah, we try to support the local businesses as much as possible. All of our bread that is used for our samples is delivered fresh every day from Red Hen Baking Co. here in Burlington. 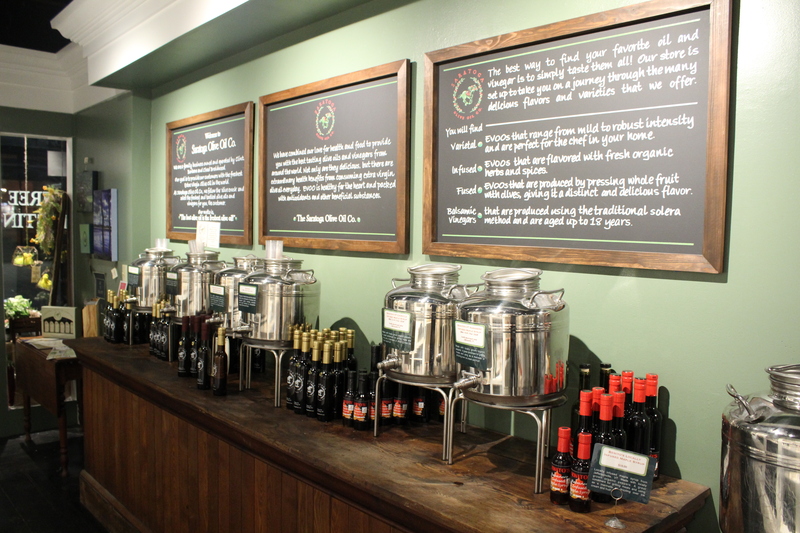 We have pour-your-own infused maple syrup from Benito’s that we’re very proud of. Grand Isle Pasta – this is what we were going for in New York and what we love about Vermont – the people here are so excited to be able to buy something from up the road. They list all of their ingredients and keep everything organic. Middlebury Chocolates, they just started up and we love their products. We’re working on a new injected bar with them where we’re bringing in honey from Green Mountain Bee Farm and take the autumn and spring ‘harvests’ and inject them into the Middlebury Chocolate. It’s going to be amazing, and will be ready before July. Tortilla LocoL, started by a few recent graduates from UVM. Two super energetic, great guys, have been making chips for friends and family for a while. Got a logo and made it official and we’ve been carrying their chips since. Even our artwork is from a local artist Anna Ayers, whose work we’ve just fallen in love with. And we try to get in good with the community. Obviously we have the samples everyday and we encourage people to come in as often as possible and try the new flavors. We do the food demos and teach people how to cook with our products. It turns into a social hour that by the second drink, it’s so noisy and festive in here – everyone is just having a blast! VTC // Sounds like a great time – count Vermont.com in for the next one! Thanks again for taking the time Chad! The next Saratoga Olive Oil Co. Food Demo is Friday April 26th– featuring an amazing menu prepared by Chef Ferguson of Halvorson’s Upstreet Café and wine pairings by Brad Kelley of Burlington Wine Shop. We’ll see you there! 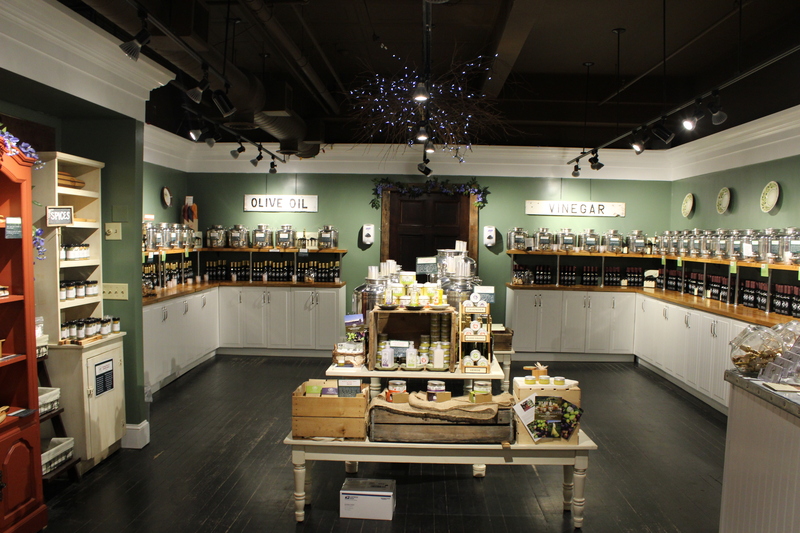 Saratoga Olive Oil Co. is located at 86 Church Street and is open for business Monday-Thursday 11AM – 6PM, Friday and Saturday from 11AM – 7PM and Sunday from Noon – 5PM.